Pixar’s parent company, Disney, has more resources to promote its upcoming films than rival studios. The Disney Parks and various Disney channels allow the company to extend its arm beyond the promotion that we see most often, such as trailers and commercials. 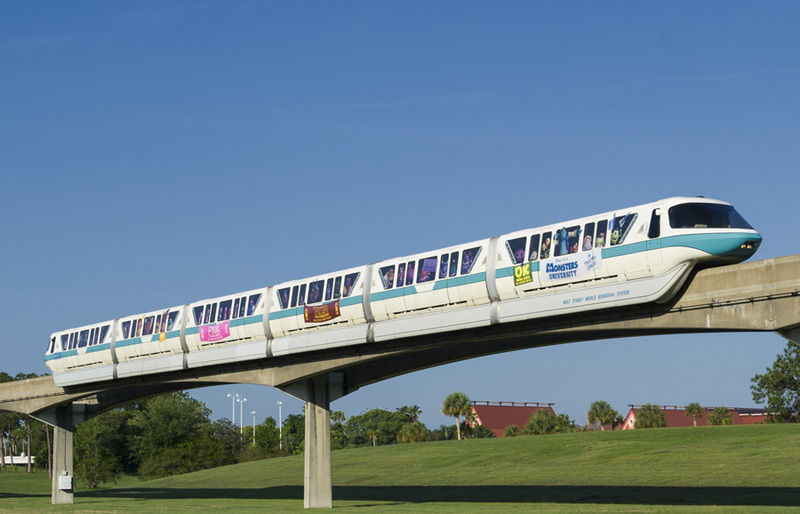 In addition to organizing “meet and greets” with film characters at Disneyland and Walt Disney World, the company has recently started to theme its park monorails in a creative fashion. 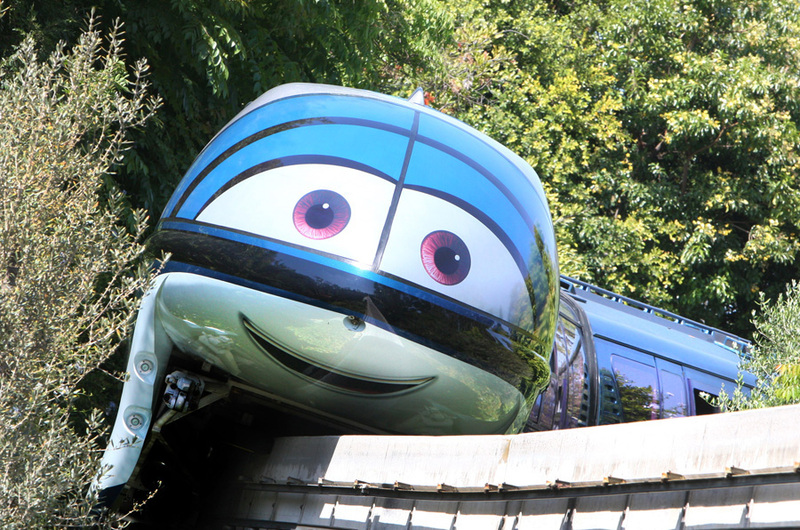 Earlier today, Disney World debuted a monorail that is covered with Monsters University characters. Take a look after the break! The Disney Parks Blog shares this news, where the cars of the monorail each feature characters from a different fraternity or sorority in the film, with Oozma Kappa taking the lead – no surprise since that is the frat that Mike and Sulley join in the film. The monsters populate the windows and are made to appear as if they are passengers. The MU monorail joins the Iron Man 3 monorail that has already been transporting Disney World guests around the resort. This is not the first time that Pixar characters have graced a monorail at a Disney Park. In 2012, the monorails at the Disneyland Resort were cleverly designed to look like they could be characters from the Cars films. This was done to tie-in with the grand opening of Cars Land at Disney California Adventure. 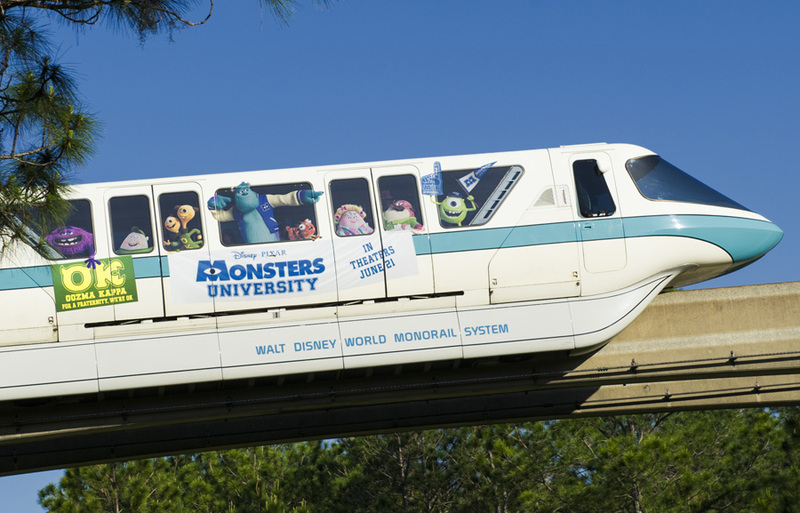 The Monsters University monorail will be making the rounds on the loop that travels between Magic Kingdom and the Deluxe Resorts. It seems like a relatively simple addition, but given that hundreds of thousands of people will view it, it is a great method to raise awareness of the film’s impending release. Monsters University is scheduled to debut in theaters on June 21.